We love what we do. The thrill of turning a large open space or indoor venue into a fantastic experience your employees will talk about for years inspires us. Our creative approach and delivery experience in large corporate days make us the specialists in our field. Enviable relationships with the best venues, fantastic crew and amazing suppliers enable us to design and deliver inspiring experiences for your teams. We are your one-stop-shop providing reliable registration, awesome activities, cool catering, superb site management, fantastic finishing touches and every last element that you ask us to organise to make your day extra special. It’s not just about your guests, it’s also about you. Our aim is to make the pre-event design, the planning process, the post event debrief and the reporting as stress free for you as possible. Everything from the event brand design, to the event teaser, invite and online registration campaign through to compiling your post-event report demonstrating the return on your investment and how your objectives were met. We’ll do all the hard work and simply present you with choices along the way, so you remain in control whilst being able to spend time on your other work related responsibilities. Bluehat Group have been designing and running world class corporate event solutions for clients since 2001. Clients asked us to support them in organising their large scale company days out having been delighted with the creativity and delivery of our team building and away days. Having delivered over 3,000 events in the last few years, Bluehat Group recently acquired award winning events company Ideas Events and a new division specialising in exactly this style of event was created. 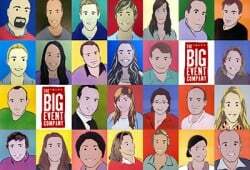 The Big Event Company gives clients all the experts in one place for when they need brilliant ideas with dependable event delivery.